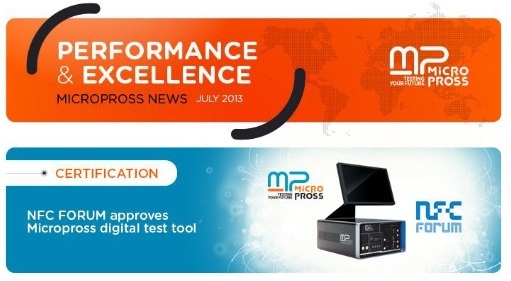 Lille, 31 July 2013 – Micropross, a leading supplier of test equipment for the smartcard, RFID and NFC industry, announced earlier today that their NFC Forum digital test tool successfully passed the NFC Forum validation process, and is now listed as an NFC Forum approved test tool. The Micropross NFC Forum digital test tool implements all test cases and sub-cases defined by the NFC Forum (more than 1300) and allows NFC device manufacturers, as well as chip manufacturers, to verify the compliance of their products with the NFC Forum specification requirements. Furthermore, this tool is also deployed at NFC Forum authorized certification testing labs, making it possible to perform pre-certification testing of products before submitting them for official certification testing. The NFC Forum digital test solution is part of Micropross Contactless Test Station product, which opens the unique possibility to users to perform ISO (analog, digital), EMVCo (analog, digital), and NFC Forum (digital, and soon analog, LLCP, SNEP) conformance testing. Only Micropross is able to bring their customers such wide coverage for contactless testing, based on a common hardware and testing platform.